Communication is essential for a thriving workplace but is preeminent in virtual organizations. Virtual organizations need to communicate extensively through email, internet chat and telephone. They must find a way to continuously connect considering there is not the everyday face-to-face contact. It is important that leaders in virtual organizations learn to build trust among them and staff, emphasize team work and encourage open communication. In addition, there must be an effective and efficient solution to virtual meetings. The Project Management Institute outlines an effective communication approach to overcoming challenges in a virtual environment. Read article The Virtual Project Manager: Seven Best Practices for Effective Communication. 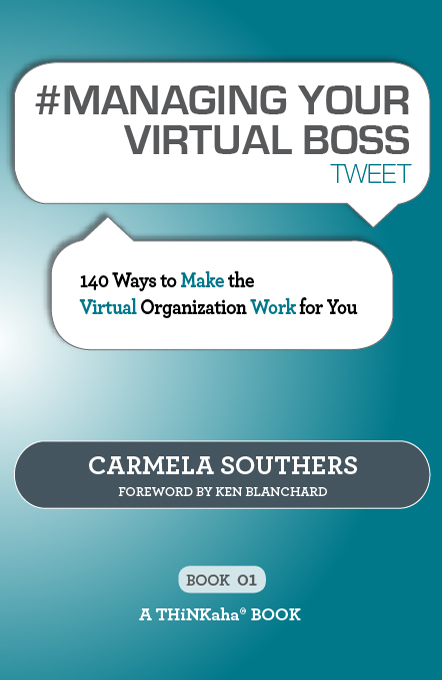 Author Carmela Southers talks about her book, Managing Your Virtual Boss- 140 Ways To Make the Virtual Organization Work for You. Southers provides practical tips that include classic strategies like how making your boss more effective ensures your own success. She also shares how although many bosses have had leadership training, leading in a virtual way is generally new to managers. It’s more important to keep your boss updated on what your doing since he or she has less of an idea if you are working virtually. Southers also gives advice about how to toot your own horn without sounding like a jerk and why you should highlight your own accomplishments. Read more at Managing a virtual boss. Citing an article from the Atlantic, Laurent Haug points out how virtual work can answer some of our current culture’s questions about women “having it all.” As women struggle with work-life balance and the ideals of family and career, finding the right equation between office and home is essential. The Atlantic article details how virtual work for one female executive actually enhances her role as a manager. She describes how the time away from the bustling office gives her a chance to think strategically about her work. Haug makes the case, however, that balancing face time and alone time is an important factor in making remote work a success. Read more at Can remote work close the gender gap?